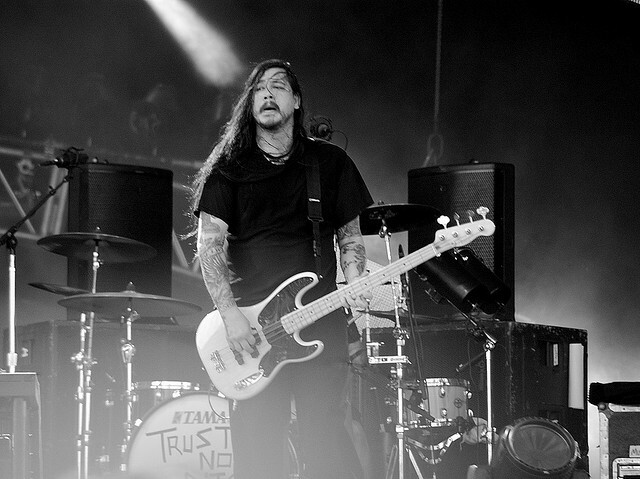 In sad news, Deftones bass player Chi Cheng’s family have announced that the musician passed away on Saturday April 13th. He was 42 years old. Cheng had been in a semi-comatose state since a car accident in November 2008, and had shown tentative responsiveness to stimuli in recent years, but never regained the ability to communicate with his family and carers. His recovery had been adversely affected by losing his medical insurance and by infections which required expensive hospital treatment – fans and band mates alike contributed to his ongoing medical costs via benefit gigs and the One Love For Chi website. Deftones were a band who emerged with the Nu-Metal scene in the late nineties and early part of the 2000’s, but endured as many of their contemporaries drifted out of fashion in the post-Emo rock scene thanks to a sound which blended the best parts of punk, metal and experimental rock – I’ve always compared them more to Black Sabbath jamming Radiohead songs in Fugazi’s rehearsal space – and by refraining from adopting the loutish posturing which so blighted a lot of their contemporaries. The band have continued to record and tour with bassist Sergio Vega (formerly of Quicksand), releasing the excellent “Koi No Yokan” album last autumn. It hardly needs saying, but he will be missed – R.I.P. Chi. Keen followers of this blog, ardent devotees of the nascent Scandinavian Symphonic Melocore scene and random Elize Ryd pervs duped this way via your custom Google searches – lend me your consciousness and read, won’t you please, an appreciation of the new Amaranthe album, “The Nexus”. Without wishing to damn the band with the faintest of praise from the outset, their sound might best be described as that most hedged of bets, ‘musically diverse’. The last time that I heard a band this keen to go off on one and veer between genres from song to song was on New Radicals‘ classic album “Maybe You’ve Been Brainwashed Too?” and that was a properly exhausting listening experience. Amaranthe’s love of dropping in different musical elements is perhaps a bit more confined to metal and its sub-genres, but in its own way this album (and band) is equally capable of banjaxing casual listeners unprepared for the extent to which the group populate songs with everything and the kitchen sink. Amaranthe start as they mean to go on with opener “Afterlife”, which bounces along on a wave of upfront synths, near blast-beat drums and Amaranthe’s unique selling point, a trio of male and female singers who cover the clean (Jake E.), harsh scream (Andy) and symphonic female (Elize) elements of the sonic spectrum. 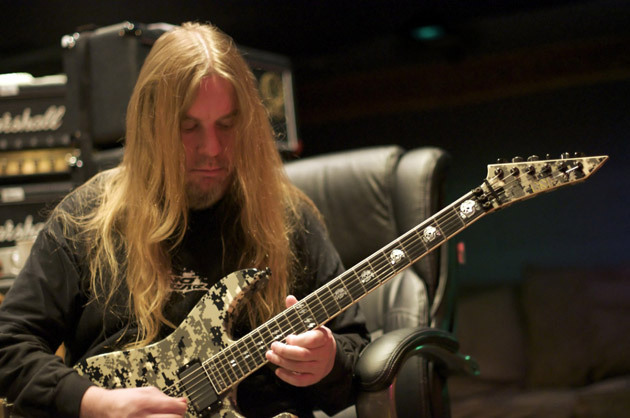 Even the most casual music fan couldn’t help but notice the band’s energy and desire to make their tunes leap out of the speakers – and that’s where some metal fans may encounter a problem. You might want to whisper it quietly around any more sensitive metalheads of your acquaintance, but Amaranthe have a distinct pop sensibility inherent in their music – I don’t know what they put in the water supply in Sweden and Denmark, but it’s resulted in a sophomore album so stuffed to the gills with once heard never forgotten, rock club dance floor-filling ear-worms that the likes of Halestorm will be casting a nervous glance over their shoulders. Sure, “The Nexus” is a nominally heavier proposition than the Pennsylvanian quartet’s “The Strange Case Of…” set from 2012, but the pop sensibility and command of state-of-the-art rock dynamics commanded by this European group is just as pronounced. It’s not difficult to imagine an R & B diva like Rihanna covering soaring mid-tempo ballad “Burn With Me” – even the title sounds like one of her tunes – and having a huge smash with it. Similarly, “Theory of Everything” has Gaga’s name written all over it – it’s a pop glam stomper just ripe for reinterpretation, but I’d be quite happy to see some enterprising radio station or music channel taking a punt on turning this band into the next crossover act. Any body who likes a bit of Evanescence wouldn’t have too much difficulty getting into this wholly melodic and refreshingly direct band. If you like your metal catchy, sonically ludicrously upbeat, lyrically driven by vaguely futuristic sci-fi positivity (it’s like cyberpunk self-help up in this joint!) and camper than an episode of “Strictly Come Dancing” with Justin Hawkins sporting a lilac Lycra catsuit, “The Nexus” is absolutely for you. My love of Power Metal is well documented on these pages and extended listening to Amaranthe’s second album leads me to conclude that they’ve just CTRL + C’d the dragons and elves out of a classic rock record and royally CTRL + V’d them with songs about love, digital ultra-worlds and stuff. TL: DR version – essential spring listening for any fan of massive, widescreen metal insanity and choruses which lodge themselves in your head and won’t bugger off afterwards. Spring? It has sprung! Well, it probably has somewhere in the world (the UK is presently shivering through the last snowy vestiges of a Winter which has long-since outstayed its welcome), so why not celebrate sunnier times ahead by enjoying the new, sophomore release from Swedish/Danish musical magpies, Amaranthe? Pop diva hooks, growling harsh vocals, keyboards duking it out for riff-mungous supremacy, drums galloping along – Amaranthe’s sound is rather akin to a bizarre and distinctly pleasurable backstage mix-up at “A Song For Europe” with lots of genres colliding together and making for a pleasingly orthodox metalhead baiting mix of tunes. For an example of the bonkers fare which awaits you if you pick up this record, why not try out the title track on the Tubes of You? Van Halen? European Tour? Huh? 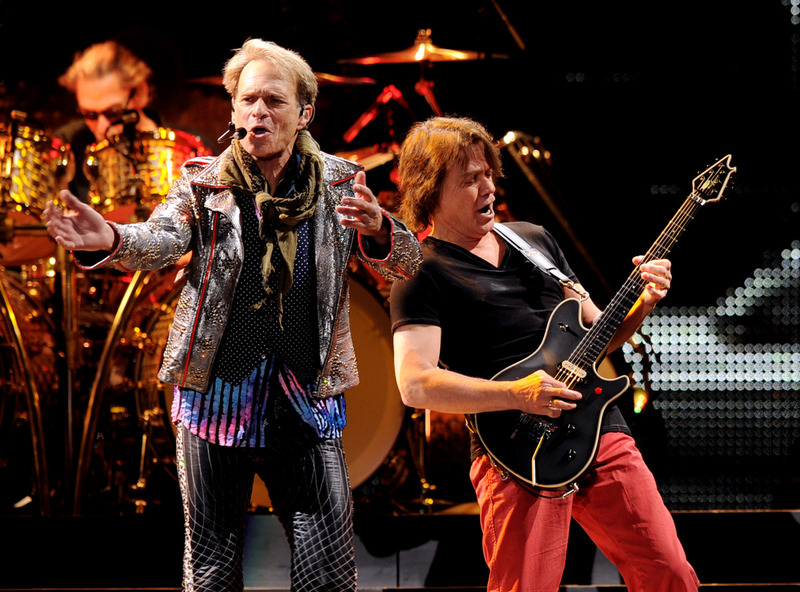 Van Halen – live in Europe before your naked, steaming eyes and ears? In news which clearly indicates the imminent arrival of quite cross, scythe-wielding, be-cloaked dudes on horseback, band front man and mile-a-minute gabber David Lee Roth has told US radio jocks Opie & Anthony that legendary rockers Van Halen intend to tour outside the US this year. I’ll believe it when I see it. It’s long been my contention that Eddie Van Halen lost his passport down the back of his sofa sometime in the nineties and couldn’t be bothered to get a new one – it’s a jovial notion vastly preferable to the idea that VH just don’t think that the rest of the world give a monkey’s for their music and that they’ll lose money on any global jaunt. 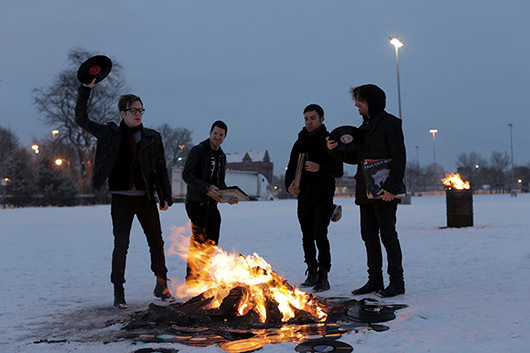 Fall Out Boy – Back! Back! Back! It’s cold work burning Taylor Swift records, but somebody’s got to do it. Happy February, every one – Fall Out Boy are back! The band who provided my daily soundtrack when walking to meet my wife at her office – “Thriller” from “Infinity On High”, a Fall Out Boy jam played so many times on the week day perambulation across Sheffield that I could have worn out the MP3 if such a thing were possible – are back with a new single, album, live shows and a plan to save rock and roll. Which is no small feat – but the unfailingly melodic tunesmiths who brought you “Sugar We’re Going Down” and “Dance Dance” are probably the chaps to accomplish such a Herculean labour. Their new tune, “My Songs Know What You Did In The Dark (Light ‘Em Up)” retains their wilful disregard for rock correctness, borrowing R&B beats and marrying them to the muscular riffs and rhythms which marked the band apart from the pop-punk rabble they were frequently, incorrectly allied with. Instantly memorable chorus? Oblique yet delightful video? Insanely long titles? All present and correct. Welcome back, boys. You’ve been missed. If you’ve ever spent any time on a UK high street, you’ll probably be familiar with music retailer HMV and their eye-scorchingly bright black and pink store fronts. You may also be familiar with their frequently hilarious overpricing, perversely good value offers – “5 Blu-Rays for £30? Don’t mind if I do!” – and their cheery Terrier mascot, Nipper the Dog. Like many UK retailers HMV has suffered the slings and arrows of the recession and finally succumbed to the inevitable today, going into administration with the prospect of 239 stores closing and 4000 staff losing their jobs – a statistic which fair chills the blood as I type it. 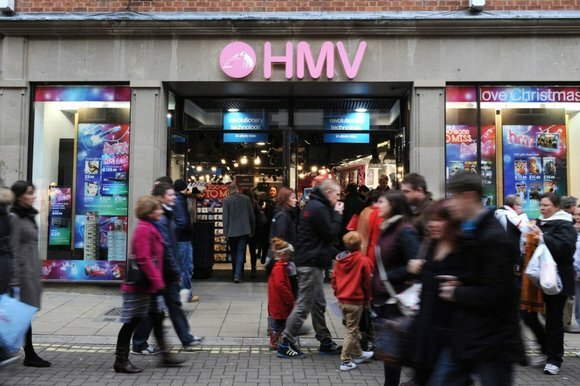 Of larger effect is the impact that HMV’s closure will have on the retail sector as a whole. In the last few years, we’ve lost UK retailers like Virgin, their successor Zavvi, Woolworths, Game and we’ve seen the resilient likes of WH Smith drastically cut back on their stock of cds, dvds and games – if you want to buy digital media in those formats, you’ve got a choice between online or taking your chances with the dwindling number of independent stores in the UK offering such products. And as Play.com just announced plans to segue into an eBay-esque ‘marketplace’ offering, the online stockists selling Blu-Rays isn’t getting any bigger. I’m ambivalent towards HMV, if truth be told. Theirs was a store that I headed to if I had a gift card to redeem, but a combination of stiff prices, unwelcoming stores, online competition and stock homogenisation sent me elsewhere for my media kicks. Younger kids prefer downloads and streaming, older consumers are cannier with their cash and will hunt high and low for a better price for physical discs- the question of whom HMV is for anymore may be the key to their unmaking.